WITH Sydney's finals hopes hanging in the balance, the Swans are picking up injuries at the wrong time. 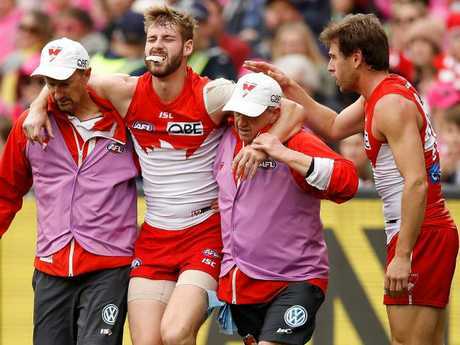 After the heart-breaking loss of Alex Johnson to a sixth ACL injury in Sunday's important win over Melbourne, the Swans will also be missing veteran defender Nick Smith for the next six weeks with a hamstring injury. With just two games left in the season, starting with Saturday's derby against GWS at Spotless Stadium, Smith looks highly unlikely to play again this year. "It's a minimum six week injury," Longmire said. "He'll do his best to rehab as good as he can but there is some tendon damage there, it's a severe hamstring. It's not one that is a couple of weeks, he's still up and about and was determined to let me know he was feeling good at training but we will see how he progresses." Smith and Johnson are likely to be replaced by Zak Jones and Heath Grundy. Jones has missed the last two weeks with suspension and Grundy hasn't played since the round 19 loss to Essendon after taking leave to deal with mental health issues. "At this stage we expect Heath to be available to play," Longmire said. "He's been training for the last couple of weeks. Zak Jones will come back in." Crosstown rivals the Giants have their own injury problems after scans confirmed Heath Shaw's season is done and Sam Reid has a minor hamstring strain. Star midfielder Josh Kelly also looks unlikely to play after suffering a concussion as a result of Taylor Walker's sling tackle during Saturday night's win over Adelaide in Canberra. "He's probably more unlikely than likely (to play)," Giants coach Leon Cameron said. "He is progressing in the right manner but if he hasn't come along in the right manner then he won't play. Heath will have an MCL (medial collateral ligament) operation next week. "It's pretty nasty and probably four months out. It's disappointing for Heath because he had a really good year. He has played some really good footy over the last 10 weeks. He will be sorely missed in our back end. 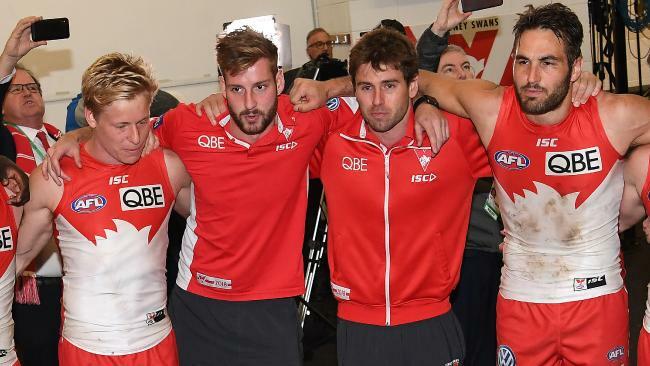 Sam Reid will probably miss just the one week." Jeremy Finlayson looks the likely replacement for Shaw and Daniel Lloyd will almost certainly come in for Reid after kicking six goals in the NEAFL last Saturday. Harry Perryman also played well in the reserves and will come into calculations if Kelly fails to recover from his concussion. Saturday's clash will be the 15th Sydney derby with the Swans holding a 10-4 lead and winning the last two clashes in round three this year (16 points) at the SCG and round 17 last year (13 points) at Spotless Stadium.